Railpictures.ca - Dave Burroughs Photo: CN 1904 with the Niagara Falls train passing the Hamilton Yard sign on a different day to CN 1904 with TH&B 72 but with the same engineer at the throttle. | Railpictures.ca – Canadian Railway Photography – photographie ferroviaire Canadienne. 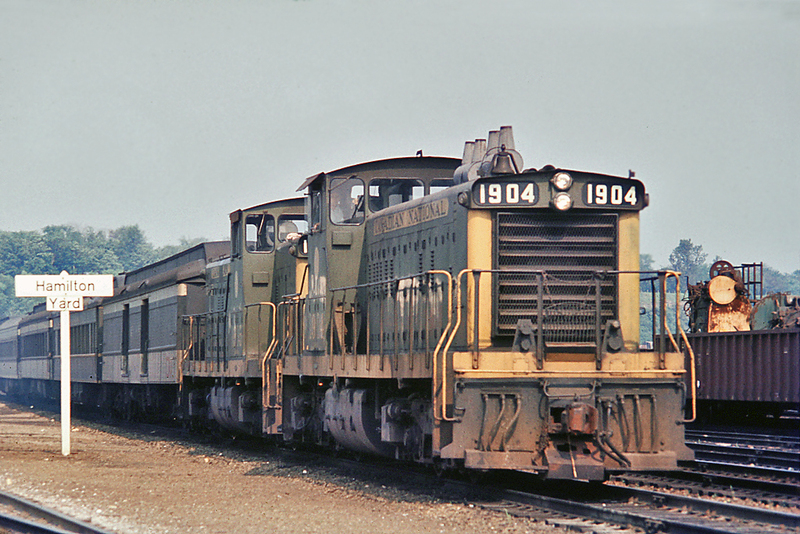 Caption: CN 1904 with the Niagara Falls train passing the Hamilton Yard sign on a different day to CN 1904 with TH&B 72 but with the same engineer at the throttle. Could be, after all, it is in Hamilton Yard. Looks to be one of the VanAlstyne twins (Murray, Bill). Hey is that the CPR Agincourt wheel truing machine in the gondola….lost in transit ?? I love the green and gold Dave! Great job!